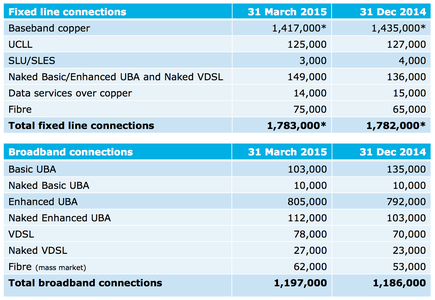 Total fixed line connections increased by 1,000 to 1,783,000 across New Zealand during the period from 31 December 2014 to 31 March 2015, according to Chorus’ quarterly update report figures. Released to the market via the New Zealand Stock Exchange, the telco reports that broadband connections increased by 11,000 lines, or 1 percent, to 1,197,000 with Chorus’ UFB communal build currently 40 percent complete with 439,000 end-users now able to connect to ultra-fast broadband nationwide. 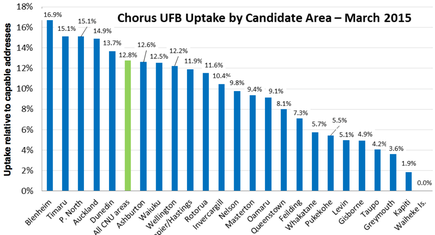 Furthermore, there has be a “significant increase” in UFB orders received in February and March, with the latter recorded as the second biggest month to date for UFB connections. 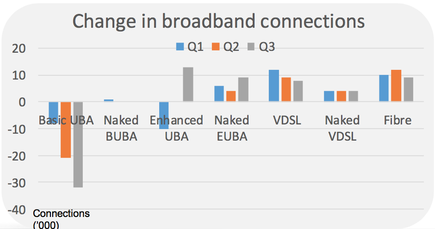 The quarter also saw the launch of the Gigatown promotion in Dunedin with ~400 1Gbps connections to date, leading to the city being ranked 1st in Australasia for broadband speed by Ookla “Net Index” global broadband rankings with 75Mbps average download speed between December and April. Away from the city and 85,000 rural lines are now within reach of better broadband through Chorus’ work on the Rural Broadband Initiative while fixed line broadband continues to gain market share from wireless. Meanwhile service providers continued focus on cost out and legacy product alternatives as competition increases following the M2 acquisition of Callplus and 2 Degrees acquisition of Snap, as reported by Computerworld New Zealand. Capping off the general findings of the quarter, Chorus also reported growth in online content offerings with Spark’s free Lightbox offer and the launch of Sky TV’s Neon service (February) and Netflix NZ (March).